Skate Girls Tribe will be part of Go Skateboarding Day in DC on June 21!!! The first day of summer in Washington D.C. heralds the event of National Skateboarding Day celebrating the pure exhilaration, creativity, and spirit of one of the most influential activities of not only local, but global youth. While skateboarding, invented in the 50s by surfers (wanting to ride the hills and valleys of the streets) is traditionally thought of as being typically male, there is no doubt a titanic rise of girls and women riding the crest of this empowering sport. 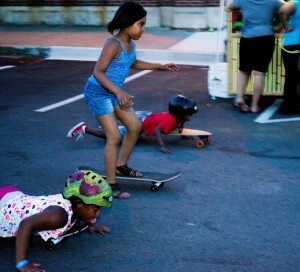 On June 21st, 2013 is the 10th anniversary of Go Skateboarding Day in DC and Skate Girls Tribe will be proactively participating. While plenty of dudes will be grabbing their gear and backpacks for the event, we are calling out all dude-ettes whom show equal enthusiasm, athletic finesse and grace in their pursuit of the almost Zen experience of being in motion and defying conventions in celebration of freedom and youthful rebellion. Skate Girls Tribe’s point? Girls can hold their own! We have seen this phenomenon of female athletic prowess not only locally in DC and other metropolitan areas, but internationally in places as war torn and remote as Afghanistan. 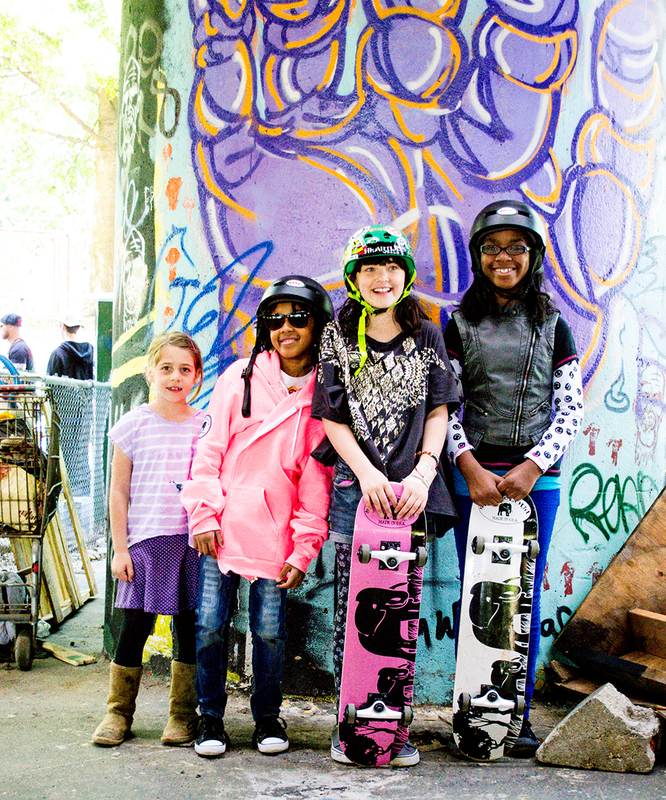 The fact is skateboarding builds confidence, creativity, and a global spirit of not only girl empowerment, but unites and helps shape a vision of peace through the freedom of athletic and artistic expression. 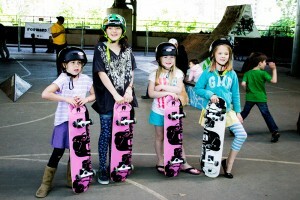 Skate Girls Tribe, a DC based group, is sounding the summit, heralding the call to all girls out there to join the movement. Join us for the event to reclaim the cause, show support for peaceful rebellion through an innocent activity, and hit the streets with exuberance, celebration, and girl power! We start at Palace 5ive at Noon on the first day of Summer! Hosted by New Beginnings Youth Development & Coaching Program and Tavon Mason Love The Kids Foundation with support from sPACYcLOUd and Skate Girls Tribe! Please join us in Baltimore, May 31 6-9pm at the CHCC Community Center 3220-A. 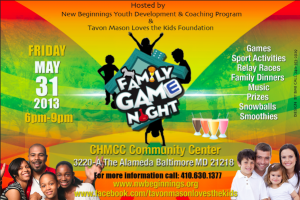 Our mission is to help the youth and families of Baltimore. There will be food and tons of games. The event is open to everyone. Let’s unite, have fun, and remind ourselves what family is all about. sPACYcLOUd will provide skateboards and safety equipment. 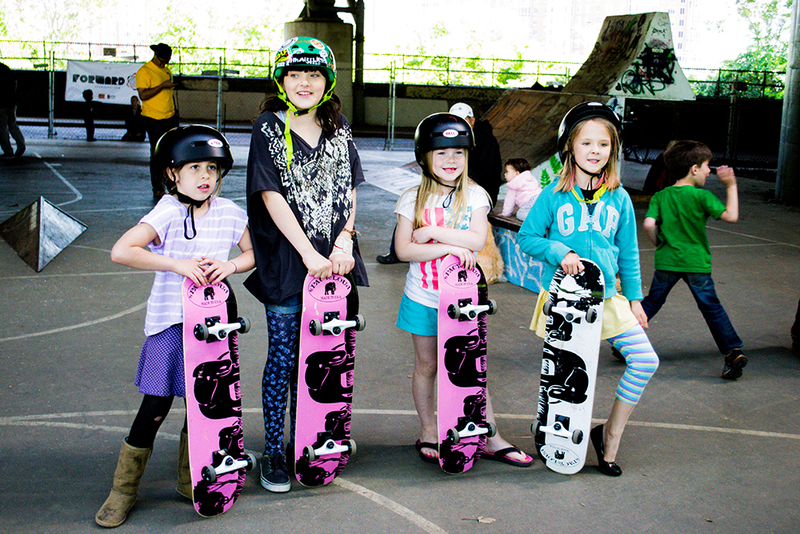 Skate Girls Tribe will bring its spirit and energy.